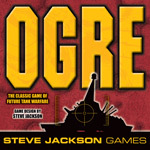 That is, Ogre climbed the BoardGameGeek charts and made it up to #3 on "The Hotness" last week. What's "The Hotness?" It's a measure of interest in a game at BGG, and appearing on the list is an indication that the readers at the site are discussing and checking out the game. And the climb couldn't have come at a better time as we get closer to sending the game to print. We're still roughly two months away from saying "Done!" -- and that all assumes that everything continues to go well -- but I'd say we're within weeks of having more Ogre material to show you. What sort of material? Well, I'm expecting blank factory samples of the 3D Ogre soon, and I wouldn't be surprised if full-size mockups of the game boards were ready at about the same time. So fingers crossed, gang, because we're on track to release the game before the end of the year.